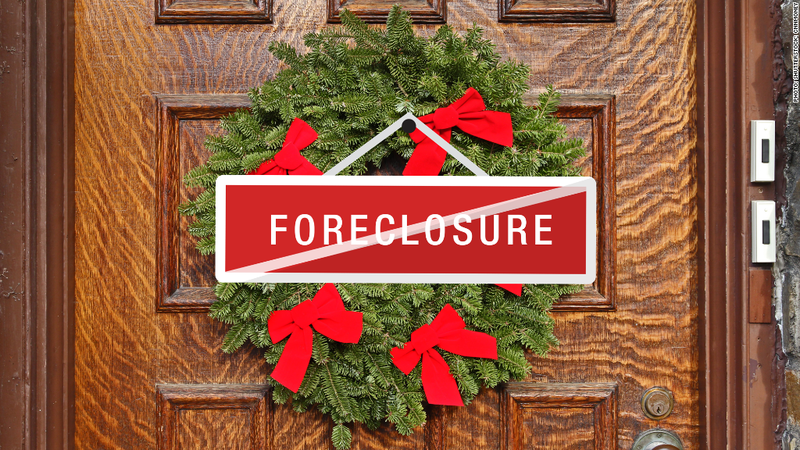 Homeowners in danger of getting evicted from their homes due to foreclosure are receiving an early Christmas present from Fannie Mae and Freddie Mac this year. Yet again, the government-backed mortgage giants announced they will put a temporary halt to all foreclosure related evictions between December 17 and January 2, 2015. "Today's announcement will bring some holiday relief to borrowers who went through foreclosure and were preparing to move," said Chris Bowden, senior vice president of REO at Freddie Mac. While evictions will come to a halt during the period, all legal and administrative proceedings will continue. The agencies will continue to file notices of default and schedule auction sales, said Bowden. If a foreclosure sale is completed during the moratorium, families won't be forced to leave their homes until after January 2. Fannie and Freddie also urged struggling homeowners to get help before it's too late. "There are more options than ever before to avoid foreclosure," said Joy Cianci, senior vice president of credit portfolio management for Fannie Mae. "We want to help struggling borrowers whenever possible." JPMorgan Chase said it will also observe a moratorium on evictions throughout the holiday season. In past years, Citibank, Wells Fargo, Bank of America and other big mortgage banks and servicers have also followed suit, but these banks have yet to announce anything for this year. Lender repossessions have been running at a rate of just under 30,000 a month, down about 20% from 2013 levels according to RealtyTrac data.